The game is called football. But what the Minnesota legislature is playing is closer to hardball. With no stadium bill gaining traction for the Minnesota Vikings, no agreement on a public funding mechanism, and with the clock ticking on the Metrodome lease, the Vikings are about as suspended as a slow motion replay of Gary Anderson’s field goal kick in the ’99 NFC Championship game. This time they need a better outcome. After 11 months of failing to gain a first down in the legislature, the Vikings are calling an audible. Instead of running straight at their opponents, they’re taking a page out of the Packer’s playbook and leaping into the stands. For the first time in their quest for a new stadium, they’re making their appeal directly to Viking’s fans. The new strategy has just been unveiled in a two-minute web video. The video is not only slick and likeable, but a very strategic communication move on the part of the Vikings. The strategy jumps from the screen in a very logical and smart manner. Their main strategic objective is to use both nostalgia and jobs as the touch points for talking directly to Minnesotans. The chart at the right diagrams exactly how the video achieves this. 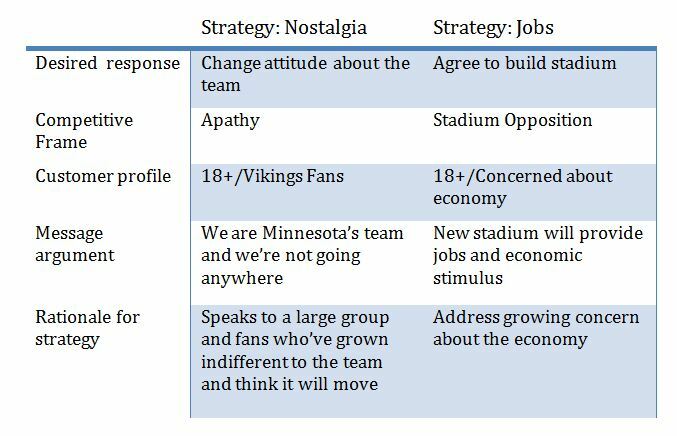 (See Figure1) The Vikings competition at the moment is apathy among fans and people who oppose building a new stadium. What the Vikings clearly need to accomplish is to change attitudes about the team’s commitment to Minnesota in addition to convincing the public that a new stadium will be good for the economy. The video cleverly uses old highlight reels to make an emotional appeal and then collides it against the rational appeal of job creation. The result is a communication message that is enjoyable and smart. So too is the channel. A two-minute video is too long and too expensive for a TV advertising flight, but as a web video it targets the very audience the Vikings most need—their own fans. In today’s world of social media, the genius of such a release invites Vikings fans and loyalists to become stadium evangelists and spread the message themselves. Rather than a direct one-way message from a traditional ad campaign, marketing researcher Duncan Watts observes that it flows dynamically among many sources and doesn’t have to originate from thought leaders or authority figures. 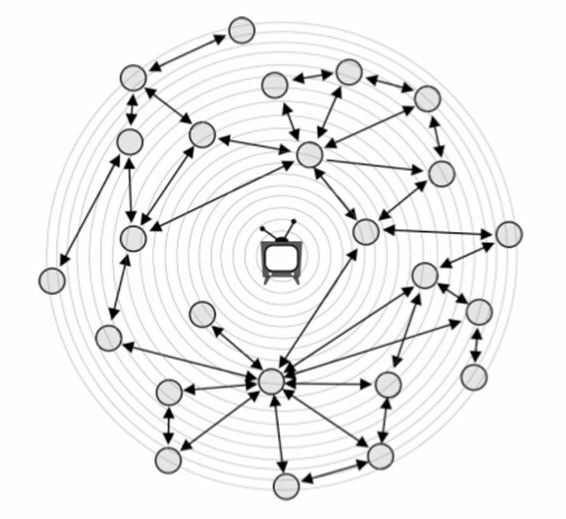 (Figure 2) In this model the most important influencers are friends. The Vikings are clearly running out of time. It’s late in the fourth quarter, the team is now hoping their fans can not only catch the ball, but lateral it to others to run into the end zone.